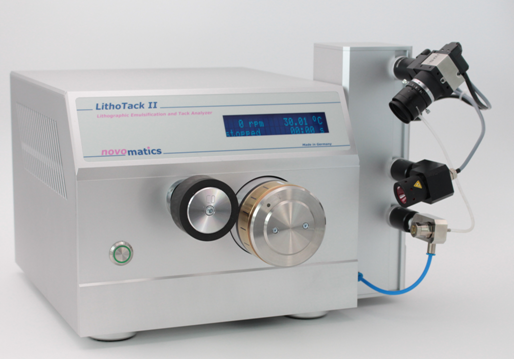 The new LithoTack II is two laboratory instruments in one. On the one hand the LithoTack is a simply to use precision tack measuring instrument on the other the LithoTack II determines water balance behavior of thin ink film under practice relevant conditions. Most importantly, the LithoTack operating conditions such as speed, film thickness and temperature are similar to those found on a printing press. A test takes a few minutes – so you can characterize and optimize your products quickly, ideally for R&D and QC. More can be answered with the LithoTack II on an early laboratory scale. Modern sensing devices like micro wave water content sensor or high speed tack sensor are scanning the emulsion properties in roller nip – the exact position where an emulsion is created. The instrument is addressed to R&D, QC and applications engineering. For example, customer’s ink and fount solution may be in same test – you may provide exact information regarding their combined water emulsification performance and so their printability. This qualifies the new LithoTack II to a high beneficial laboratory instrument regarding early cost savings and advanced customer loyalty.